The Feast of St George – A reflection. How lovely it was to see that parishioners attended mass at St. Josephs on the feast of St. George, the patron saint of England. We were married 40 years ago in the city of Canterbury, which like many other English cities and towns after the protestant reformation in the 16th Century, under Henry VIII, the catholic faith had all but disappeared. We are members of the National Trust, and we have visited the melancholic Fountains Abbey, Yorkshire, which fell under the dissolution of the monasteries. Also we have visited Oxburgh Hall, Norfolk, where you can see and actually crawl inside the priest’s hole. These are just two poignant reminders of a tragic past. It is significant that in 2011 members of the thriving Catholic Church can attend a catholic mass once yearly in Canterbury Cathedral. This is evidence that St. George, our soldier saint, still works and cares for England with his love. 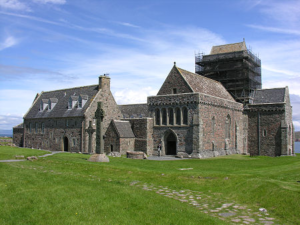 Iona, the beautiful island off the West coast of Scotland is a place that I have visited on several occasions, sometimes with my family, with friends or on my own. As a practising Anglican I always attended services at the Abbey, but also felt very attracted by the small Roman Catholic chapel on the island. I visited it several times and was always aware of a sense of peace and presence. One year I persuaded a friend to go and stay at the House of Prayer with me. I was able to attend Mass there each day, I explained to the priest that I was not a Catholic. We stayed there for a week and enjoyed good weather and the wonderful light evenings and beautiful scenery. We went on boat trips, swam in the sea, and went on the Pilgrimage to St. Columba’s Bay, where Columba and his fellow monks arrived from Ireland. We enjoyed good food, provided by Sister Jean and we sat up talking late into the night with other guests who were staying there. I attended Mass each day, always going forward for a Blessing and discovered that the Liturgy was very similar to that in the Anglican Church. I loved the quiet, the faith, respect and reverence shown by other Catholics who worshipped there. Sometimes we would stay for a long time after Mass just being quiet and enjoying the Presence. On the last day of the holiday while I was in the Chapel it felt as if a door was being opened for me and I could step through it if I wanted to. The peace and Presence and gentleness that I felt seemed to be an invitation. I began to view the Catholic Faith with new eyes. When I returned home the thought that I might ask to be received as a Catholic suddenly seemed very difficult. It had seemed very easy and ordinary when I was on Iona! I knew that what I was about to do would be misunderstood and that it would upset some people. I knew I had to do so this carefully and be sensitive to other people. I knew too that the Anglican Church had nurtured me very well and I was keen to see that this was acknowledged and that I would always remain in friendship with the Anglican Church. I have been a Catholic for almost a year now and you will see me most weeks at the 6.30 Mass at St Joseph’s with my husband. I was helped to do this by our Parish Priest, Canon Seamus, by my understanding husband and by the prayers and support of good Catholic friends and one week by the children at the 9.30 Mass who carried their pictures into church with the words, “don’t give up!” I give thanks for it all and pray constantly for unity between all Christians. My roots in the Anglican Church are acknowledged and valued and I give thanks for that too. I was born in Bedford in July 1936, to convert parents. I was baptised at Holy Child & St. Joseph Church on 9thAugust 1936 by Joseph Canon Tonks. From age 5 -7, I went to school at the then Convent of the Holy Ghost, Bromham Road and made my first confession and first Holy Communion, [prepared by the Sisters, probably at the hands of Canon Malone] at the church and was confirmed there by Bishop Leo Parker. In 1948 I went to Ratcliffe College near Leicester. Whenever I was home on holidays I always attended Mass at Holy Child & St. Joseph, my parish church. When I left school in December 1953, I got involved in parish life. I joined the choir, the SVP and served at the altar. When I did my two years of National Service in the Royal Signals regiment [1955-57], whenever I was on leave at the weekend I attended Mass at the church. In 1958 I went to try my vocation with the Salesians at Bollington near Macclesfield in Cheshire, but came home again in September time to settle down into parish life. A parishioner, Mr. Laurence Maple [Father Francis Maple’s father], invited me to join the Third Order of St. Francis, which I did. 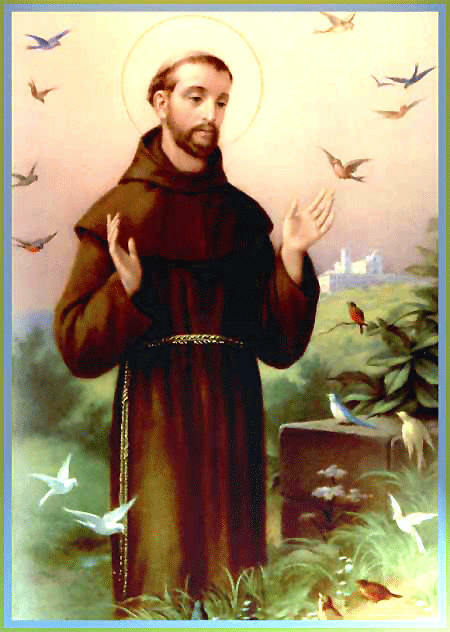 It is now known as the Secular Franciscan Order and has had a great and beneficial effect on my spiritual life as well as introducing me to my wife, Anne! I was professed for life in November 1960. My wife, Anne, became a permanent member of the parish with me when we were married in the church on 3rd August 1964. All our six children were baptised, had their first confessions and Holy Communions and were confirmed in the church and all attended our Catholic schools, which are extensions of our parishes. For many years I have been a Reader and Special Minister of Holy Communion, at church and in people’s homes and sometimes in hospital. These are very rewarding ministries, open to men and women and I urge more people to offer their services in this way as we are sometimes short of those willing to serve. In 2010 I presented a tour of our church for Shalom, the ecumenical group to which Anne and I belong. Some of our own parishioners attended. It was then suggested that I should put the tour into a booklet, which I did, with much help from Richard De Souza, who is now one of our seminarians from this parish. Every Thursday we have the opportunity of Eucharistic Adoration in the Reconciliation chapel from after the 10.45 Mass until 7 p.m. I am surprised and disappointed that so few people commit themselves to this weekly opportunity to get really close to Jesus in silent prayer. So much of my spiritual life originated here and still continues, so I feel a real part of the “Church” in this place. Praise the Lord! 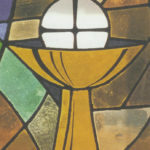 There is always the feeling of unworthiness, but we are all unworthy to receive Our Lord in Holy Communion, but does that stop most people from receiving? It is also, undoubtedly, a calling of service to our brothers and sisters, especially when they are imprisoned in the home or in hospital and unable to get to Mass. So we should be prepared to make ourselves available to our parishes as the disciples made themselves available to Jesus. So I say, “Here I am, Lord; I come to do your will.”[Response to psalm 40, Feast of the Annunciation.] When Jesus fed the five thousand, he used his disciples to help him, especially in clearing up the left-overs! It gives me great joy to minister the Body and Blood of Jesus to my brothers and sisters and I thank God for coming to unworthy me in Holy Communion and for calling me to minister him to my brethren. It is especially rewarding when I offer the Sacred Host and am met with a lovely smile. What a wonderful privilege for us lay folk, to be called to Minister Jesus to our brothers and sisters in Christ.